The face of Penrith is changing, with Penrith Council approving the development of hundreds of units in the CBD in the last two months, with thousands more planned. Millions of dollars worth of high density apartment living in the CBD will cater for the west’s growing population, that is predicted to require 30,000 new dwellings in the next 15 years. A Penrith Council spokesperson said studies show that to respond to shifts in demographics and population, a further 9,210 apartments will be needed by 2031. “Equating to a total demand for approximately 461 apartments per year across the Penrith Local Government Area,” he said. Deputy Mayor Ross Fowler said the apartment ‘phenomenon’ in Penrith began with the development of Thornton Estate, changing the area from suburban to an urban dense lifestyle. “There has certainly been an uptake in apartment applications in the last two to three years and it seems to be continuing into the future,” he said. People looking to break into the real estate market could do so in Penrith, with 147 apartments approved since the start of March, including 50 in a $5.7 million five storey project in Colless Street, Penrith. The further 97 apartments will be in Union Road across one six storey and two seven storey buildings valued at $13.5 million, with all three buildings having their own basement car park. 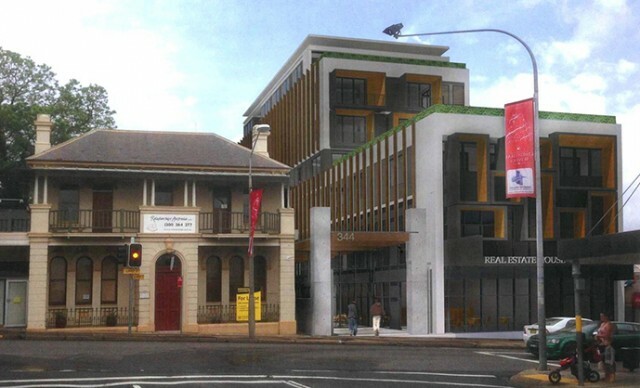 In a meeting on Monday night, Council approved a $9.6 million application for 39 apartments in Fulton Street, Penrith. Currently in discussion and on public exhibition are another 112 apartments, over two development applications for Rodley Avenue and Lethbridge Street both with an underground car park. 42 units in a six storey building are being considered in Rodley Avenue worth over $9 million, and another six storey building in Lethbridge Street could bring a further 70 units, at a cost of $20.2 million. Council has also received an application for a seven storey mixed use development in High Street, Penrith, for 39 units and more underground car parking (pictured). The ground and first levels of the $13 million project will be open to commercial tenancies, with street frontage onto High Street. St Marys CBD hasn’t been left out of the equation, with the approval of a seven storey building with 48 units on Gidley Street, valued at $7.1 million. These approvals do not include the number of applications for medium density living such as townhouses.